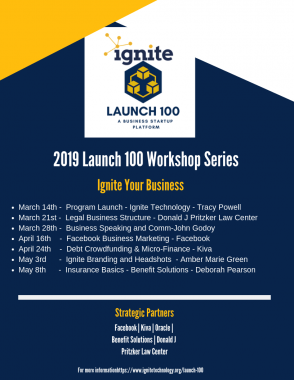 CHICAGO - March 12, 2019 - PRLog -- Ignite Technology and Innovation business startup Incubator Launch 100 has released a series of workshops and events. The workshops were created to enhance the Launch 100 program. The workshops are free to members of Ignite Technology and Innovation and Launch 100 participants.